- Digital Window Plus Picture-in-Picture (PiP) Menu. - Dual Tuner Picture-outside-Picture (PoP). - Dual Viewer Split Screen (PoP). - MultiViewer-3 Auto Channel Surf. - Thumbstick Illuminated Universal Remote (8-Device). - UltraTEC Bitmap On Screen Display (Tri-Lingual). - 181 Channel Tuner with Auto Programming. - Plug & Play Interactive Setup. - Auto Link (Video Input Sensor). - On-Screen Help with Auto Demo. - Front Panel Menu Controls. - Channel Lock/Video Lock/Quick Lock. - Front Panel Lock Out. - Soft Mute (50% & 100% Mute). - 4-Event ON/OFF Program Timer. - Sleep Timer (15 to 180 minutes). - Closed Caption Decoder (CC). I bought this badboy at a garage sale. $20, awesome steal. Just needs a little re-calibrating, but this badboy is awesome! Color, blacks look black, good resoution. Needs to be re-calibrated often; convergence drifts. The Hitachi 53uwx10b rptv surpassed my expectations. It is a great rptv but it is fragile. If it is not calibrated just right it can look terrible. I enjoy watching HDTV sports & movies. I'm very pleased but glad I know how to do calibrations on it to keep up the great looking picture. the price, the price, the price! But, is it really worth the price? I bought the Hitachi 53UWX10B because i've been wanting a big screen tv for some time. I especially liked the fact that it is hdtv compatible. 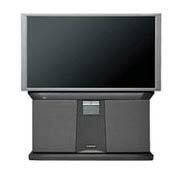 However, I thought that the advances in technology would give this digital projection tv an advantage over older analog projection tv's. My mom's 4 year old hitachi projection tv has a better picture. On the 53UWX10B, when I watch a dvd movie, horizontal edges on objects looked blurred and have like a rainbow effect. The eyes of people don't look defined. In general, fine detail on images look blurred. I'm considering taking this 53UWX10B model back to sears because I am not satisfied. It also takes a good 2 seconds to tune in on the next channel, ditto for picture in picture viewing. My 6 year old magnavox tube has much better resolution. analog hitachi projection tv and my 6 yr. old magnavox tube. ONLY STRENGTH IS THE PEOPLE AT THE STORE REALIZED WHAT A PIECE OF CRAP IT IS AND GAVE ME NO HASSLE RETURNING IT FOR A FULL REFUND, AND IT WAS A CLEARANCE MARKED DOWN FLOOR MODEL! HITACHI 53UWX10B IS THE BIGGEST PIECE OF CRAP. ONCE I GOT THIS UNIT HOME AND TURNED IT ON, THE BOTTOM THIRD OF THE SCREEN HAD A RAINBOW SUPERIMPOSED. ALSO, ALL THE TEXT FOR THE BOTTOM HALF OF THE SCREEN WAS DOUBLED OVER. I FELT LIKE I WON THE LOTTERY WHEN I WAS ABLE TO RETURN IT FOR A FULL REFUND THE FOLLOWING MONDAY. I JUST PURCHASED THE 42-Inch TheaterWide® HD HDTV-Ready Television 42H82, IT IS 98389348484489448 TIMES BETTER. Nice size, easy to set up. Fair remote. Very good DVD picture with alot of contrast and brightness adjustment. Has a problem with cable, especially the reds. Need a receiver (surround decoder) to improve movie watching. Screen problems with noticable (fingerprint) type lines. No DVI connection. (may be important in near future). Read all the reviews I could find, I do have to say that I am Disappointed with this TV. With digital cable this unit seems to have a "decoder" problem--the reds have extended lines going through the subject. (like the chroma bug, only much worse). The techs -- 2 of them tell me this is normal with cable. There is also a (bullseye) screen effect around the middle-sides of the screen. Especially noticable during lighter portions of the program. (By the way-- the Toshiba or Sony do not have this problem). This TV is easy to set up and adjust. The dvds look very good (except for this screen--fresnel effect.) (By the way, had both cable and TV repair techs tell me this is normal with this unit. )TV tech tried to set the manual convergence, ---to no avail. The remote is average, It certainly can not control all the funtions necessary to operate the Denon 3800 or the DVD player. You will still require the original remotes to get into the necessary functions of the other components. The internal features such as changing the scanning from 540i to 1080i during cable viewing have very little to no change effect. ( same with DVD playback.) The different "fill and stretch modes" make everything look abnormal. Hard to watch sports in fill or smooth wide formats. Find myself looking at grey side bars most of the time. I cannot report on cable reception at this time with my unit. It may be better than cable. ( I will be trying this soon). I tried sitting at different positions, I find 12 feet from the screen about the best. (the room is 16' wide by 20' long in a walk out basement)(lots of windows facing south). The color can be set up as you would like--I find the auto settings lacking in purity. The colour is not consistant from station to station. I find myself always adjusting the colour. (the auto functions do not seem to do it right. Too much red or green if you let the auto do it. When everything is just so the TV does look very good, I think the new Sony 51sw500 or the Toshiba look better, more consistant. This 53uwx10b is going back for a reselection. (thanks to the great store I deal with---The Brick Canada. I have the SWX10B model.I've noticed that during dark scenes in DVD movies where light is eminating from a source,such as a candle burning in in a dark room a green halo appears around the lit object. Also blue and green dots sometimes move randomly accross the screen.Sears has picked up the tv checked checked it out, brought it back and told me thats normal for that tv.I refuse to believe that it's normal.Has anyone else experienced this problem?. Bought 53UWX10B from sears before i read the reviews love it has a great piocture even with cable,some reviews say it has a dad picture from the cable I disagree I used RCA gold coated coax cables one from my wall to my cable box and another fromthe cable box to the TV, grat pic as good as my Hitachi 35 inch tube which I thought had a great picture. I also used RCA gold monster cables for my DVD and VHS and my cable box audio to my stero, works great. Easy to set up just need to tweek the picture setting to your personnel pref. As far as the magic focus goes some people said it did not work well I have had zero problems with mine got it home hooked the TV up let it warm up 20 min as per the dirrections Did the magic focus thig in all the setting movie sport news ect. then on a sport channel witth a DVD and a VHS, sears said the only time you really need to do the magic focus thing is when you move the TV it self and if the pic starts to look blurry. I did the magic focus 3 Mth ago and had zero problems or any need to use it yet and have a great picture. As for the channel vahnge being slow this is true but i go thru my cable box and the problem goes away, but when i use my ANT B selection for PIP which does not goe thru my cable box yeat it is slow but i do not use my PIP that much. Sound is ok but not great I fix this buy running thru my JVC stero and suround sound speakers a cheap fix to a small problem since i already had the stero and the speekers. As far as not being able to read CNN or ESPN score tickers on the bottom of the screen if you whatch the TV in Smooth wide this problems goes away and if it still does not read your owners manual and ajust your picture center. It took me about one hour to have every thing hooked up adjusted and ready to go . would recomend this TV to any one price and qulity is great.